Rahul Dravid believes day/night Test cricket can be part of the future having experienced first-hand MCC's experiment with pink balls under floodlights in Abu Dhabi. 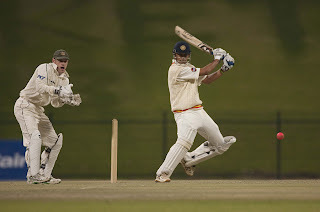 Dravid hit 106 in the second innings against Nottinghamshire and was impressed with his first sighting of the different coloured ball as MCC continue their trials into floodlit first-class matches. Dravid's first attempt ended with a second-ball duck on the opening day when he was trapped lbw by Luke Fletcher but he had much more success second time around. It was a valuable experience for Dravid, who is also part of the MCC World Cricket Committee which is pushing for day/night Tests. "There is definitely a future for day-night Test and first-class cricket," Dravid said. "I think there are a few further tweaks that need to be made, and it would be beneficial to play some more trial matches at different venues and in different conditions, but as with any new innovation administrators and the players will need to take a leap of faith at some point." When the pink ball was first used in the corresponding fixture last year there was criticism about the colour of the seam which has been modified by the manufactures Kookaburra. Dravid said for the most part he had no problems picking up the ball although, a little like day/night one-day cricket, the twilight period was a little tricky. "The 30-40 minutes when the natural light starts to fade, and the lights begin to take effect are challenging, and batting does become a little bit more difficult - but once you get through this period sighting the ball is quite easy," he said. "If you are established at the crease it is not such a problem, and for a new batsman starting his innings, it is really just something to keep in mind. With practice players will learn to adapt to the challenge, and tactics will start to come into play, which can only add interest."